Please call owner Jerry at 810-887-7445. Boat is on Harsens Island, Michigan. 37' Marinette Flying Bridge with custom hardtop with full windshield, side and aft curtains enclosure. 1990 original owner professionally maintained by Harbor staff. Always indoor stored in winter, recent survey May 2012 available on request. Mechanical- Twin 350 Crusader Marine engines 454 cu in 680 hours. Onan 6.5kva Genset, dual a/c-heat, 300 gal fuel tanks, 120 gal fresh water tank, 12 gal water heater. Electronics- Full instrumentation, ship to shore w/ hailer, King Loran C, GPS w/ connection to laptop running Maptech, Depth sounder w/ speed, Automatic windlass. 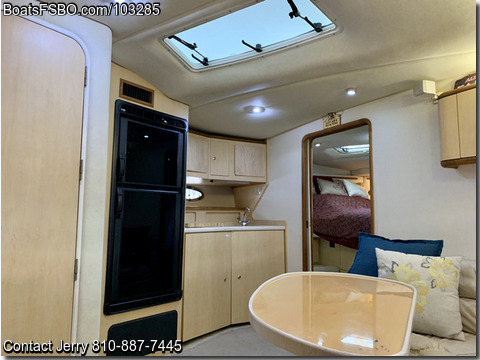 Galley & Interior- 2 Staterooms w/ walk around queen size, full size bed; 2 Heads aft & fore w/dual doors,w/ ceramic tile, showers, Raritan Crown Marine Head Salon has TV w/ VCR DVD, Stereo w/ 8 speakers wet bar w/ ice maker, Sleeper couch and two upholstered chairs Teak trim & cabinetry. Galley w/ 3 burner stove and oven, full double refrigerator/freezer dual voltage, Microwave, deep galley sink, large teak cupboards.